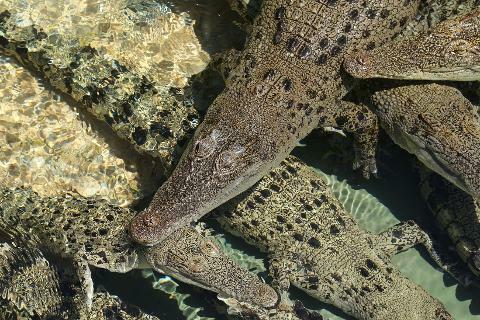 Crocosaurus Cove, located in the heart of Darwin city, allows visitors a unique, up close and personal view of Australia’s iconic Saltwater Crocodiles. 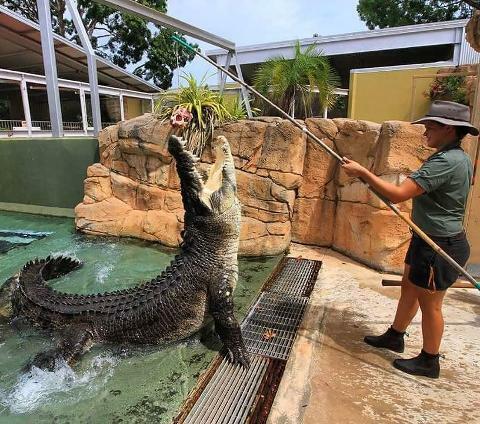 Bringing together some of the largest Saltwater Crocodiles in Australia & boasting the World’s largest display of Australian reptiles, Crocosaurus Cove is a must see attraction when visiting Darwin and the Top End. 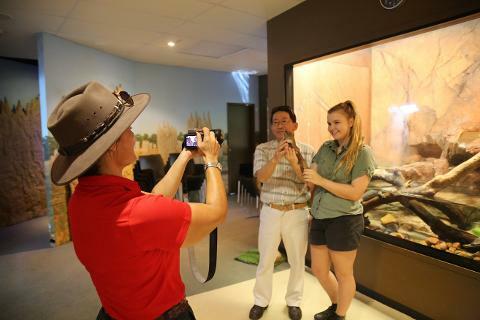 Bring your bathers and “Swim with the Crocs” jump on our “Fishing for Crocs” platform and smile for the camera while holding a baby Saltwater Crocodile. Check out the Barramundi, Archer Fish & Whiprays in our 200,000 litre fresh water aquarium and don’t forget our upstairs Top End Turtle enclosure. Crocosaurus Cove is also home to the famous, Cage of Death. The only cage in the world that brings you face to face with some of the largest Saltwater Crocodiles in captivity. Go it alone or grab a friend – this is a once in a lifetime opportunity to share the same environment of one of the world’s deadliest predators. All of this and more awaits you at Darwin’s ultimate urban wildlife experience…right in the heart of Mitchell Street, Darwin City. The first iconic story is the Royal Flying Doctor Service, affectionately known throughout Australia as the RFDS. Founded by the Reverend John Flynn, it began its aero medical operations in the Northern Territory in 1939. Using the latest innovations in holographic technology, the hologram of John Flynn is portrayed by an actor who tells the story of Flynn’s vision and its realisation into the RFDS of today. “Bringing our founder, John Flynn, back to life as a hologram will enhance the storytelling experience for visitors to the RFDS tourist facility in Alice Springs,” RFDS Central Operations Chief Executive Officer, John Lynch, said. Experience a decommissioned RFDS Pilatus PC 12 aircraft completely aero medically equipped and learn about the activities of the RFDS’s pilots, engineers, doctors, and nurses, and the experiences of the patients that are carried and cared for each day. The second iconic story featured is the Bombing of Darwin on 19th February 1942. The bombing of the harbour brought destruction to the city of Darwin, and many of the experiences and stories of what happened that day through the most modern and exciting technology. 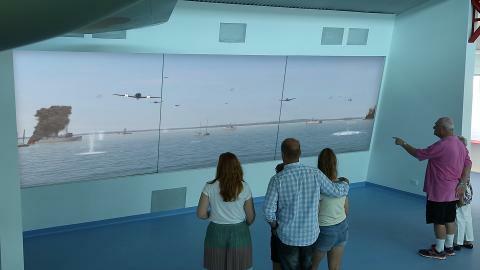 This new and exciting world-class facility will feature never seen before cutting edge technology – holograms, virtual reality and a projection window of the Japanese air attack on the harbour. View a life-sized replica Japanese Zero aircraft suspended from the ceiling and the workings of a val bomb. Rear Admiral Etheridge Grant was the Commanding Officer of the USS William B Preston. Grant was not on board the USS William B Preston at the time of the attack and He was blown into the harbour as he attempted to return to his ship and crew, and spent most of the attack in the water, clinging to a large ship’s buoy. The life size hologram of Grant, narrates his own version of events. The Virtual Reality transports you back to Darwin Harbour of 1942. You are at the original Stokes Hill Wharf, standing on the deck of the Neptuna as it bombed to the point of it exploding and sinking as well as sitting on the wing of an American Kitty Hawk, engaging in a dogfight with the Japanese Zero's. 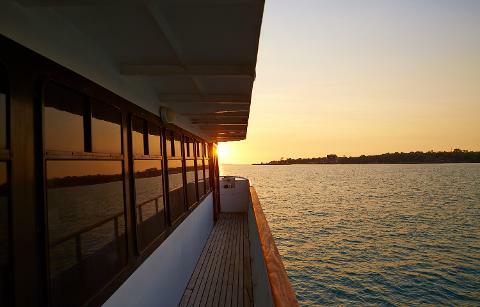 The two hour sunset cruise includes commentary of Darwin's rich & diverse history as well as some of the best views of the city's famous sunset. There is a licensed bar onboard & snacks are available on board for purchase. 24-hour Hop On Hop Off pass on the Darwin Big Bus which can be used on separate days within a 30 day period. 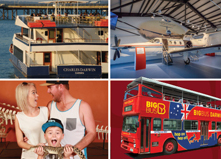 Experience the celebrated scenery, landmarks and attractions of Darwin. 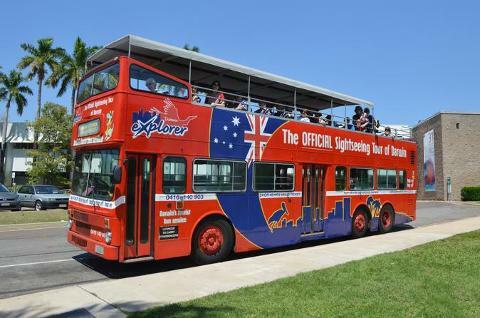 Don’t miss a thing aboard our open top Double Decker tour of Darwin completed with an informative and entertaining commentary. Your 24-hour pass will commence when you exchange your voucher with an Explorer driver or street staff member at any of our stops and will be valid till the same time the following day.